A failure to address the mountains of waste in the developing world will result in as much plastic in our oceans as fish, the head of Ocean Conservancy has warned. Andreas Merkl, CEO of the Washington-based environmental NGO, said the combination in the developing world of a burgeoning middle class and low recycling rates will lead to an exponential rise in the amount of plastic washed out to sea. 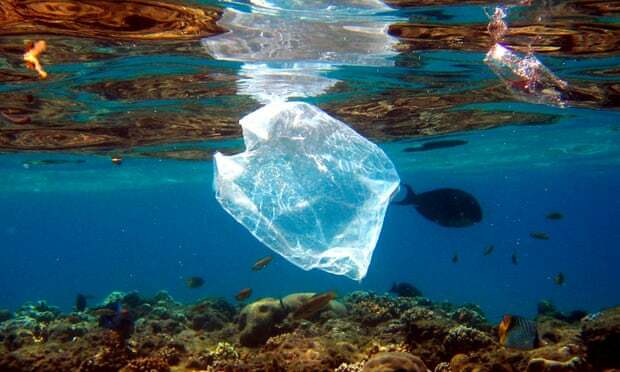 If governments and the private sector fail to solve this problem, “we end up with an ocean that has an amount of plastic that’s in the same order of magnitude as the amount of fish, in terms of tonnes”, Merkl told Guardian Sustainable Business. Novelli said the problems were becoming particularly acute in regions – such as parts of Asia – that have a huge middle class, but trash collection of only around 40%, compared with 95% in the US. It’s important for business leaders and policy makers to come out of their separate silos and work together on solutions, Novelli said, adding that there is an opportunity to partner with big and influential countries like China and India to redesign the world economy. In the search for practical solutions, the Trash Free Seas Alliance, a collaboration between industry and NGOs, is planning to carry out detailed studies in three or four countries, with a particular emphasis on Asia. He said it was disingenuous to seek a ban on non-recyclable flexible plastic, like cellophane, as it is an “enormous accelerator in lifestyles”. Not only does wrapping food reduce the spread of typhoid, but single-use containers gives people access to clean water. Fortunately, Merkl said the issue is starting to rise up the political agenda, helped by the sight of giant gyres of marine debris and by people from the developed world going on beach holidays and finding plastics clinging to their bodies. There is also growing concern about the toxicity of fish that end up eating small fragments of plastic, which they mistake for plankton. It’s a health issue,” Merkl said. “It’s an equity issue. It’s a land pollution issue and it’s an ocean pollution issue. While improving collection and recycling is the quickest way to drive change, Merkl insisted that plastics companies and consumer goods firms also must act decisively. Ellen MacArthur, who broke the world record for the fastest solo circumnavigation of the globe and is now a leading activist in creating a circular economy, also said changes in all sectors of society are needed. She is encouraging private companies and cities to collaborate to ensure that “everything has value to the economy in the future” and does not just get thrown away. Bill McDonough, the US designer and author who believes we can design materials, systems, companies and products that continuously improve over time, said the Chinese were starting to take the lead in turning the circular economy from an idea into reality. McDonough, the co-creator of the cradle-to-cradle design concept, said the authorities in Beijing are currently moving from “promoting the circular economy to implementing it”.